Thorlo socks might be the number one name in making feet comfortable. Normally, few people think about how important a sock truly is. The right sock keeps your feet feeling good, and healthy too. 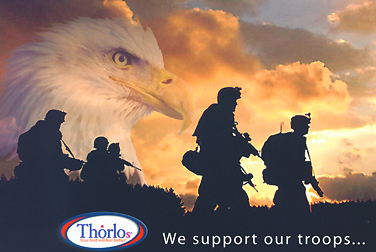 Thorlos pride themselves on their wide variety of socks; each is custom made for a specific purpose. People tend to preoccupy themselves with getting supportive shoes when they should also look for supportive socks. Wearing the wrong sock can lead to foot fatigue and irritation when worn in the wrong shoe. Thorlos are designed to help eliminate fatigue as well as blisters and other foot irritations, while at the same time being comfortable and supportive. These boot socks are manufactured within the United States, so that you can support America's workers, while you wear the best socks made for feet. One more thing - These socks wash easily, and they outlast almost every other sock in the marketplace. Personally, they outlast about 3 times, the dress socks I used to buy, and twice the 3 times of my work socks. I guess two more things - There is no stitch line inside the sock to irritate your toes. OK, 3 things! They don't bunch up under your feet unless you wear really cheap shoes that would crawl anything. Thorlos have a great sizing system. Once you understand it, it's easy. Some of us like a tight fit. Some of like a looser fit. With Thorlos, you can usually wear your choice of two close sizes. They are forgiving and supportive. God Bless you & your feet! customer favorite. 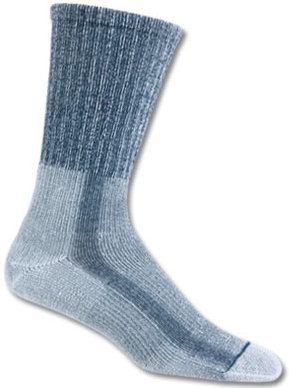 TWW Western Mid-Calf Boot Sock - Also known as Thorlos Western Work socks. These socks are specially designed to be worn with lacers, ropers, and any other shafted or 8 inch laced Western work boot. It's exclusive THOR.LON® construction wicks moisture better than traditional socks, and moderate cushioning in the ball/heel of the sock helps reduce shock, impact and blisters. Cushioning in the arch is also added for a better fit and level of comfort. A wider toe box allows for the best fit. 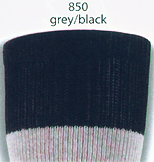 If your calf is extra wide, this boot sock is a good choice because there is just the right amount of "hug". We have found the cushioning to work well with weightlifting and with work boots too. In fact, we have rolled down the tops to wear with lower top footwear, and they still look good. Available in white (004) or navy denim (401). TWW11 is a ladies, or smaller men's fit. TWW13 is a larger ladies, or average men's fit. keeps rough edges off you calves while dancing your two step. These socks are specially designed for Western boots with tops of 12 inches or taller height. This original western boot sock can stay in place all day. It's exclusive THOR.LON® construction wicks moisture better than traditional socks. Light cushioning in the arch is also added for a better fit and level of comfort. An extended heel pad helps protect against blisters, and the spandex top ensures the sock stays in place as long as you need it to. Available in white, black or navy. This sock looks like a dress sock when worn with lower top footwear. The taller top works as a protective skin barrier between your leg and the inside of tall top boots. This boot sock is a favorite of our customers. Available in white (004), navy (501) or black (509). TWD11 is a ladies, or smaller men's fit. TWD13 is a larger ladies, or average men's fit. Dana wears a 6.5 ladies boot. She wears the size TWD11. She enjoys the supportive feel of these Western dress socks when standing on concrete floors all day. gives your foot, and ankle, the support it needs. These socks are specially designed for running trails. It's exclusive THOR.LON® construction wicks moisture better than traditional socks and the added Coolmax® feature helps your feet feel cooler. Moderate cushioning in the ball/heel of the sock help to reduce impact, shock, shear, and blisters. Light cushioning is also added to the arch for a better fit and spandex in the top aids support. Available in white, charcoal or walnut. 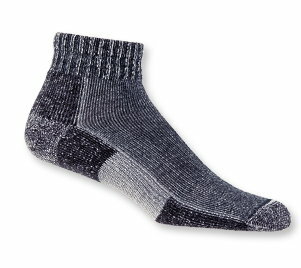 This trail sock is a good choice for times you want a lower top in your hiking, or fashion boots. Also, some ladies prefer wearing pantyhose, and this lower sock, worn over the hose, can give support without being seen from your boot top. Available in walnut heather (741), or charcoal heather (742). TRMX11 is a ladies, or smaller men's fit. TRMX13 is a larger ladies, or average men's fit. gives your foot, and ankle, the support it needs without sweating you to death. 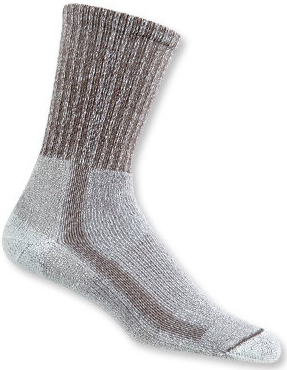 LTH Light Hiking Mid-Calf Crew Sock - Also known as Thorlos Men's Light Hiking socks. These socks are designed to be worn with lacers, ropers, and any other shafted, or 8 inch laced Western or work boot / shoe. It's exclusive THOR.LON® and Coolmax® construction wicks moisture better than traditional socks. Your feet feel great! Moderate cushioning in the ball/heel of the sock helps reduce shock, impact and blisters. Light padding in the instep area protects against lace pad pressures. Ventilation panels for better moisture wicking. 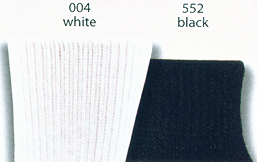 Cultured Cowboy likes to offer this sock for shoes and boots that have lower tops. Sometimes ya just want some color other than white. I used to match my shirt color with my socks, until some "cute thing" commented about how awful that was. Upon research, I found most guys do blend with their pants. Upon getting old, I decided I'd just wear whatever felt good anyway! 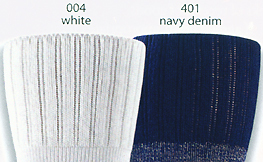 Available in walnut heather (736), black heather (737), everglade heather (738), or navy heather (739). LTH13 is a larger ladies, or average men's fit. gives your foot, and ankle, the support it needs without sweating you to death. 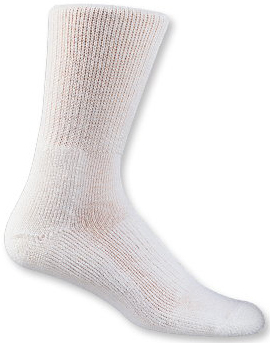 LTHW Women's Light Hiking Mid-Calf Crew Sock - Also known as Thorlos Women's Light Hiking socks, include extra stretch yarn in the ankle for a ladies ultimate comfort. 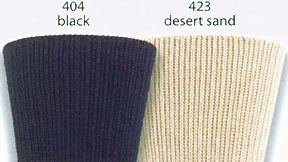 Cultured Cowboy likes to offer this sock for shoes and boots that have lower tops. Sometimes ya just want some color other than white. Ladies are more sensative to this color issue than most of us guys. So we added this series of pretty colors for you! Available in slate blue (101), khaki (103), charcoal (104), flamingo (105), or sage (107). LTHW10 is a medium ladies fit. LTHW11 is a ladies large fit. better protects their feet from too hot, too cold, too big and sometimes, too small sizes. For the littlest adventurer. Designed with CoolMax® to wick away moisture and help prevent blisters. Midweight padding in the heel and ball protect the foot from shear and impact forces and helps prevent painful blistering. A lace pad protects the top of the foot from boot lace pressure. Ventilation panel in the sock helps with the wicking of moisture. Available in navy, walnut, and bubblegum. These kid's boot socks take up a little space in the boot, so that heel slippage is reduced. The inside kind'a looks like a terry cloth towel, and will "mush" to comfortably fill any gaps, while cushioning precious bones. Best kid's sock around! Available in navy (716), walnut heather (717) or bubblegum (718). KOX7 is a smaller kid's fit. KOX9 is a larger kid's fit. 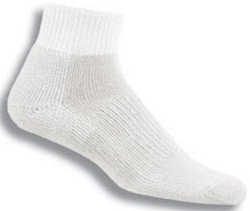 Thorlo's LSX Liner Sock allows moisture to wick better and your feet to feel more comfortable. 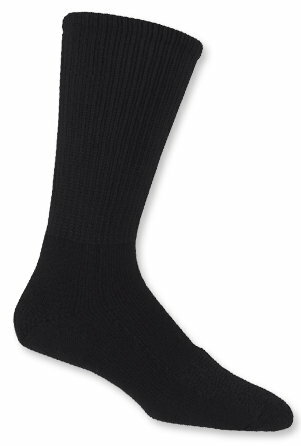 These socks are made to be worn with Outdoor Thorlos®, or other socks, as a second layer of warmth and/or protection. They have Coolmax® construction to help wick moisture better and to keep feet feeling cooler. They have minimal cushion on the balls/ heel for a more comfortable feel. Available in gray and white. 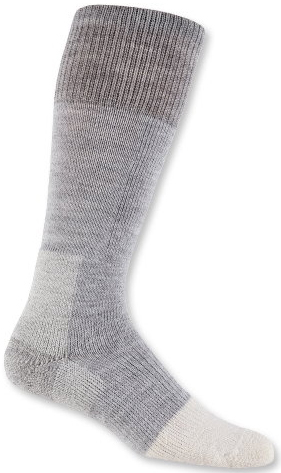 When you need 2 pair of socks for warmth, these liners are a great second pair. When you need minimal cushioning with a high quality sock, made for real feet, wear these alone. Available in white (004), or grey (295). LSX11 is a ladies, or smaller men's fit. LSX13 is a larger ladies, or average men's fit. Thorlo's LS Over the Calf Liner Sock stays in place, and adds support. 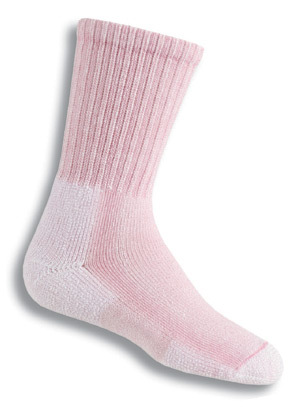 These socks are made to be worn with Outdoor Thorlos® or other socks, as a second layer of warmth and/or protection. They easily come up over the calf. They have Coolmax® construction to help wick moisture better and to keep feet feeling cooler. They have minimal cushion on the balls/ heel for a more comfortable feel. Available in gray and white. Sometimes, you just prefer a thinner sock than a regular Thorlos boot sock. If so, give these your next try. All the help to prevent athletes foot fungus, without any bulkiness. LS11 is a ladies, or smaller men's fit. LS13 is a larger ladies, or average men's fit. 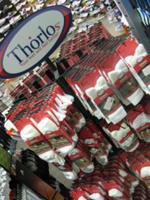 Thorlo's WLST Safety Toe Socks give extra protection in the toe box, and the right cushioning underneath your feet. WLST Safety Steel Toe Socks- Moderate Cushion with extra padding in the toe area. These socks are designed to protect against the steel toe plates found in many work boots and work shoes. It's made with exclusive THOR·LON® construction for resilience, durability and better wicking. Moderate cushioning in the ball/heel reduces blisters, calluses and foot fatigue without the sock being to bulky. Thick cushioning over the toes helps prevent abrasion common in steel-toed footwear and light cushion at the instep protects against lace pad pressure. Available in black and white. We have found the extra cushioning around top of the toes also works to wick away more moisture in feet that really sweat a lot. This sock is good for roofing, where you are putting lots of pressure on your toes working steeper pitched homes. Available in white (004), or black (305). WLST11 is a ladies, or smaller men's fit. WLST13 is a larger ladies, or average men's fit. Thorlo's WGXS Support Socks move with you, sort of massaging your leg throughout your day. 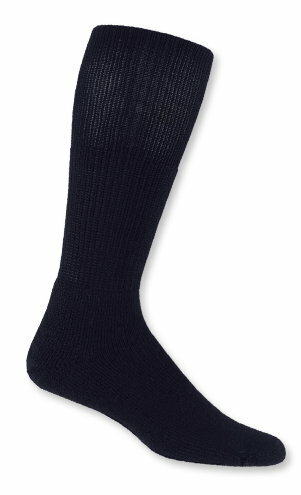 WGXS Uniform Support Socks- Moderate Cushion with leg support. 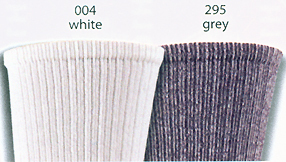 These socks are designed to reduce foot and leg fatigue caused by extensive standing or walking. Available in black and white. It's made with exclusive THOR·LON® construction for resilience, durability and better wicking of moisture. Moderate cushioning in the ball/heel reduces shock, impact and blisters. Light cushioning is added to the arch for a better fit and comfort and extra spandex throughout the top helps to provide support to keep your feet feeling good no matter how long you're up and about. Available in black and white. 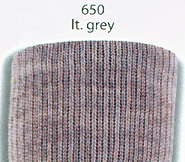 This gives a taller top sock without quite the tightness of the upper elastic found in Thorlos Western Dress boot socks. A good choice for all from smaller to larger calves because the support runs all the way up your top. WGXS11 is a ladies, or smaller men's fit. WGXS13 is a larger ladies, or average men's fit. Thorlo's Casual Crew Sock. Notice the extra padding under the ball of your foot. CLT Casual Thorlos - Thick Cushion to be worn with casual footwear. 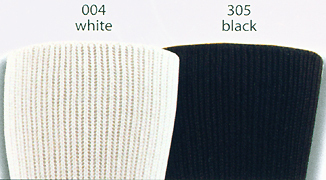 These socks are designed to reduce foot and leg fatigue caused by extensive standing or walking. It's made with exclusive THOR·LON® construction for resilience, durability and better wicking of moisture. Thick cushioning in the ball/heel reduces shock, impact and blisters. Moderate cushioning is added to the arch for a better fit and comfort. THOR·LON® pad at the ball helps to provide support to keep your feet feeling good no matter how long you're up and about. Available in brown, navy, khaki & black. OK, even cowboys wear shoes, not always a boot. So, should we give up the great comfort of a Thorlo sock, just because we change our shoes? ...I think NOT. Available in brown (801), navy (802), khaki (803), or black (804). CLT13 is a larger ladies, or average men's fit. 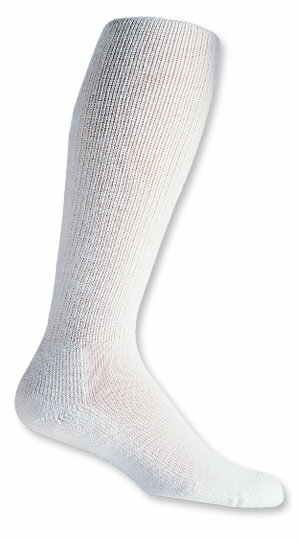 Thorlo's MPT Physical Training Crew Sock gives Anti-Microbial, Anti-Odor Protection. This sock can be worn with most footwear, even if you just wear them for long days at work, in an office. 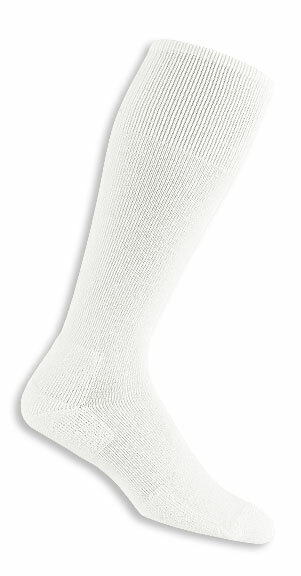 Thorlo's MPT Physical Training Mini-Crew Sock gives Anti-Microbial, Anti-Odor Protection. 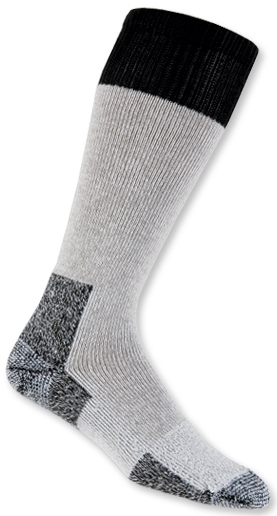 This sock can be worn with most footwear, even if you just wear them for long days at work, in an office. MPT Physical Training Socks- Moderate Cushion designed to reduce fatigue caused by extensive physical training regimens in military and gymnasium environments. These socks are designed to reduce foot and leg fatigue caused by extensive physical training regimens and workouts, as those in military careers. Available in black and white. It's made with exclusive THOR·LON® construction for resilience, durability and better wicking of moisture. 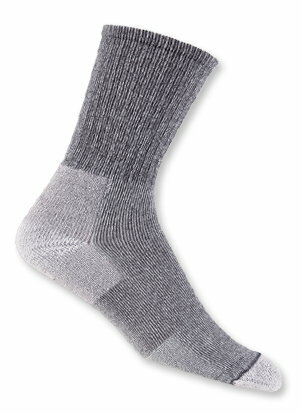 X-Static® - The Silver Fiber, is knitted into the foot area to provide permanent Anti-Microbial and Anti-Odor benefits. Moderate cushioning in the ball/heel reduces shock, impact and blisters. Thin cushioning is added to the instep for lace pad pressure protection. A better fit and comfort you'll appreciate. Available in two styles: Crew and Mini-crew socks. 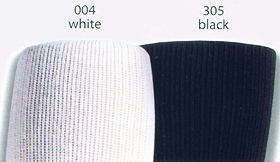 Available in white (004), or black (552). MPT9 is a smaller ladies. MPT11 is a ladies, or smaller men's fit. MPT13 is a larger ladies, or average men's fit. Thorlos has such a wide variety of disciplines in socks. We know it can be confusing. All of their socks are made to pad, protect, and allow proper warmth; all this, so you do not sprain, rot, or continue to ruin your feet. If you have questions, please call Cultured Cowboy, and we will help you to develop a proper program of footwear and socks for your lifestyle. Designed to enhance mobility and maintain foot health under rigors of tactical wear, and day long training. These socks are designed to reduce foot and leg fatigue caused by extensive standing, running, drills or maneuvers. Available in black and desert sand. It's made with exclusive THOR·LON® construction for resilience, durability and better wicking of moisture. 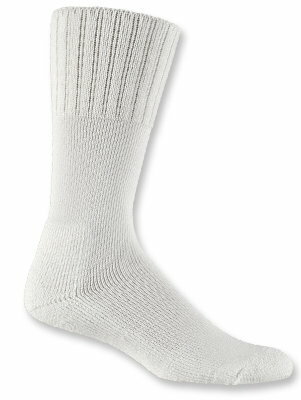 X-Static® - The Silver Fiber, is knitted into the foot area to provide permanent Anti-Microbial and Anti-Odor benefits. Moderate cushioning in the ball/heel reduces shock, impact and blisters. Thin cushioning at instep and arch provides a comfortable fit and ultimate support. Available in black and white. 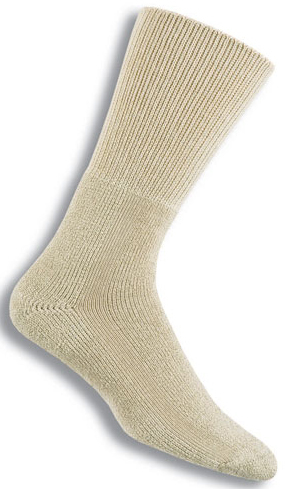 If foot odor and cracking between your toes is a problem, this sock might be your best answer. The anti-microbial properties might not only reduce embarrassing smell, but keep your feet healthier than they have been in a long time. Available in black (404), or desert sand (423). TBX9 is a smaller ladies fit. TBX11 is a ladies, or smaller men's fit. TBX13 is a larger ladies, or average men's fit. Made for EMS, police, security, or other jobs where you wear your socks for long periods and may be called upon for fast action at any time. Do Not let your foot discomfort interfere with saving lives! enhances mobility and maintains foot health in field training & combat conditions. MCB Combat Socks - Thick Cushion, mobility, support, protection. 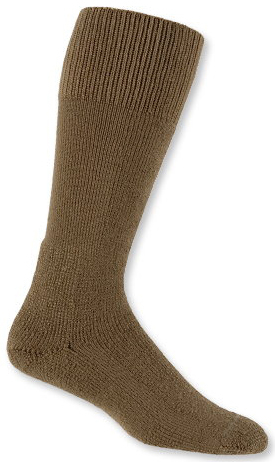 These socks are designed to reduce foot and leg fatigue caused by extensive field training and combat conditions. It's made with exclusive THOR·LON® construction for resilience, durability and better wicking of moisture. Thick cushioning in the ball/heel gives maximum shock, impact and blister relief. Moderate cushioning is added to the shin and instep to protect against abrasion and boot pressures. Moderate cushioning in the arch for a better fit and comfort. Spandex throughout the top helps hold in place all day. Available in five colors. Available in black (404), olive (420), desert sand (423), coyote brown (424), or foliage green (504). MCB11 is a ladies, or smaller men's fit. MCB13 is a larger ladies, or average men's fit. If they are the best made, for protecting the military that protects us, then you know they are the best made for you too. Same quality for all! protects your feet in moderately cold weather hunting. These socks are designed to reduce foot and leg fatigue caused by extensive standing or walking. It's made with exclusive THOR·LON® construction for resilience, durability and better wicking of moisture. Thermolite® Blend gives maximum warmth and wicking. Moderate cushioning in the ball/heel reduces shock, impact and blisters. Full padding around the toe for maximum protection. Provide support to keep your feet feeling good no matter how long you're up and about. Available in grey/black as shown. This gives a taller top sock without quite the tightness of the upper elastic found in Thorlos Western Dress boot socks. Another good choice for larger calves. TF11 is a ladies, or smaller men's fit. TF13 is a larger ladies, or average men's fit. 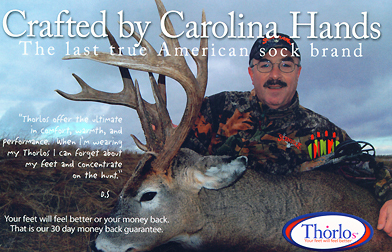 A Most Popular Hunting / Fishing outdoor sport sock. 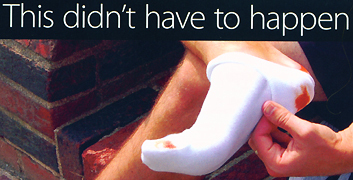 These socks are designed to reduce foot and leg fatigue caused by extensive standing or walking. It's made with exclusive wool/THOR·LON® construction for resilience, durability and better wicking of moisture. Also, there is a ventilation panel to even better wick away that foot moisture. (The faster you can get this moisture away from your feet, the dryer, the warmer, your feet will feel.) 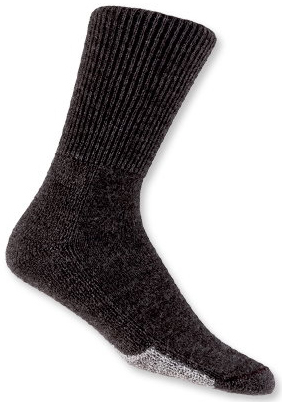 100% worsted wool toe gives maximum warmth at your most extreme body area - toes. Moderate cushioning in the ball/heel reduces shock, impact and blisters. Full padding around the toe for maximum protection. Available in light grey as shown. Warmth and support to keep your feet feeling good no matter how long you're trying to sit still in that stand! HEOU11 is a ladies, or smaller men's fit. HEOU13 is a larger ladies, or average men's fit. Now that your feet are nice and comfy, with the right socks, you'll need the perfect boot to go along with them. Check out our Cultured Cowboy Boot Index for a top of the line selection of Western, Western dress, Exotic Western, and work boots. Brands from Wolverine, to Justin, to Twisted X, Ariat and more!